Bord, Janet, and Colin Bord. Ancient Mysteries of Britain. Manchester, N.H.: Salem House Publishers, 1986.
r . n sabbat In earlier times, a diabolical gathering of witches. In modern times, a seasonal celebration observed by Wic-cans and Pagans. tence—most notably the great festivals of Beltane (observed May 1) and Samhain (observed October 31)—and the belief that heretics held obscene rites. The sabbat also may be related to the Bacchanalian and Saturnalian rites of the ancient Greeks and Romans. The term sabbat is Old French and is derived in part from the Hebrew Shabbath, "to rest," pertaining to the seventh day of the week designated by the Ten Commandments as the day of rest and worship. Some historians say that sabbat as it was applied to heretics and witches was anti-Semitic, for Jews were among the heretics. Similarly, heretics, and sometimes witches, were said to meet in synagogues, a term that also was used synonymously with sabbats. 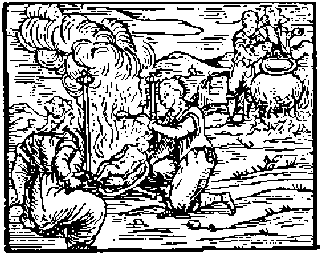 The sabbat became much more prominent in continental Europe during the witch-hunts than it did in England, where there is no record of a witch sabbat prior to 1620, except for an innocuous feast that was termed a sabbat in the Lancaster witch trials of 1612 (see LANCASTER WITCHES). The assemblies of heretics were described as including sexual orgies, gluttonous feasting, worship of the DEVIL, blasphemous and diabolical rites and copulation with demons. As witchcraft became heresy, these activities were attributed to witches. 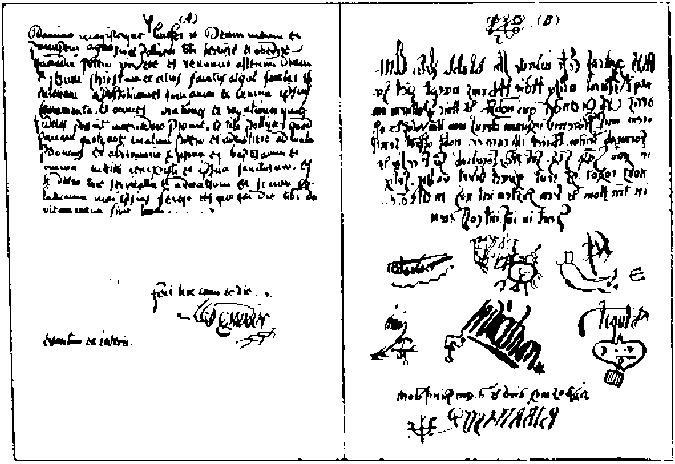 The first mention of a sabbat in a trial of the Inquisition occurred in Toulouse in 1335. 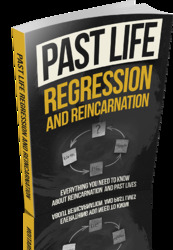 The term sabbat (also sabbath) for these meetings was not applied regularly until about the mid-15th century. Once the sabbat appeared in trials, however, it quickly assumed a certain form. Sabbats invariably took place at night in remote locations, such as mountains, caves and deep forest areas. The best-known gathering place for sabbats was the Brocken in the Harz Mountains of Germany, where the greatest activity took place on WALpuRGISNACHT (beltane), April 30. To get to a sabbat, witches flew through the air, sometimes on the backs of demons that had metamorphosed into animals, or astride broomsticks or poles (see flying). The witches themselves sometimes changed into animals (see METAmorphosis) and were accompanied by their familiars. The Devil usually appeared in the shape of a he-goat, ugly and smelly, though at times he was said to arrive as a toad, crow or black cat. He presided over the sabbat while sitting on a throne. The witches took off their clothes and paid homage to him by kissing his backside (see KISS of SHAME). Unbaptized infants were offered up in SACRIFICE. New witches were initiated by signing his black book in blood, renouncing Christianity, taking an oath and trampling upon the cross (see initiation). The Devil marked his initiates with his claw (see DEVIL'S mark). 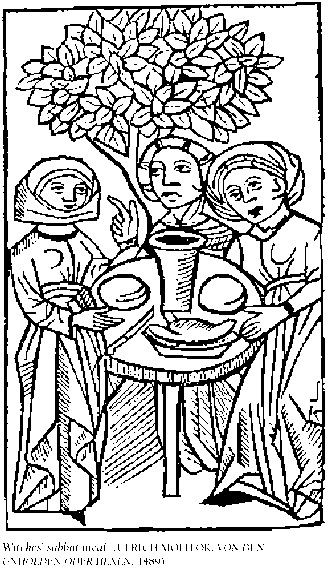 There followed a great feast, with much drinking and eating, although demonologists often noted that the food tasted vile and that no SALT was present, for witches could not abide salt. If infants had been sacrificed, they were cooked and eaten. After the feasting came dancing and indiscriminate copulation among the witches and demons. On occasion, the witches would go out into the night and raise storms or cause other trouble (see STORM RAISING). The witches flew home before dawn. The nights of the sabbats varied. Some witches said they attended weekly sabbats, while others said they went only once or twice a year. [They] heard a noise and a very dreadful uproar, and, looking on all sides to see whence could come these frightful howlings and these cries of all sorts of animals, they saw at the foot of the mountain the figures of cats, goats, serpents, dragons, and every kind of cruel, impure and unclean animal, who were keeping their Sabbath and making horrible confusion, who were uttering words that were most filthy and sacrilegious that can be imagined and filling the air with the most abominable blasphemies. It is doubtful that such organized, malevolent activities took place. Most likely, the witches' sabbat was a fabrication of the witch-hunters, who seized upon admission of attendance at a gathering, meeting or feast and twisted it into a diabolical affair. Victims who made such confessions were pressed to name others who had attended the sabbats. In this manner, sometimes entire villages became implicated in Devil-worship. Contemporary Witches and Pagans use the term sabbat to describe their seasonal holidays, but increasingly prefer terms such as seasonal celebrations or seasonal festivals which do not carry the stereotyped image of sabbat. See Wheel of the Year.